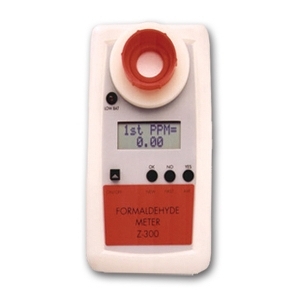 Environmental Sensor Co.’s Formaldehyde Meter is a hand held instrument that measures formaldehyde concentration with a range of 0- 30 ppm and a resolution of 0.01 ppm. The instrument makes it possible to monitor Formaldehyde vapor in air, while performing operations using Formaldehyde solution. It is often used for applications such as medical instrument sterilization or chemical processing. The instrument has a LCD display giving real time concentrations in ppm and a time weighted average after 30 minutes of use.